It’s Friday morning, and I have my kids settled at the table in our motorhome. They just had banana-chocolate smoothies and bagels, and now they’ve opened their math books and have begun to practice multiplying decimals. I sit on the couch next to my husband, who is working on his laptop. I open mine, thinking that I’d better check Facebook before I do one more thing; tomorrow’s Halloween, so there are bound to be a lot of activities going on in the RV park. “How many problems did you get done?” I ask my children, interrupting their concentration. “Five,” says one. “Two,” says the other. Now, I rarely let anybody interrupt my homeschool. We are five-hundred-fifty days into an open-ended tour of the U.S., and there are so many things to see and do that study time has to be fiercely guarded. However, life is a little different this month. We’re attending a three-week rally in Virginia with our traveling homeschool group, RVHS, and let me tell you, we have to be up for anything. Sure enough, about twelve kids show up to carve pumpkins on the picnic tables near Burrell’s site. After the pumpkins, there’s just enough time for lunch before they run off to the playground. At 1:30, they’ll make Halloween lanterns, at 2:30 they’ll have Pickleball practice in preparation for their upcoming tournament. At 6:00, there’s a potluck, and when it gets dark, there’s an outdoor movie. 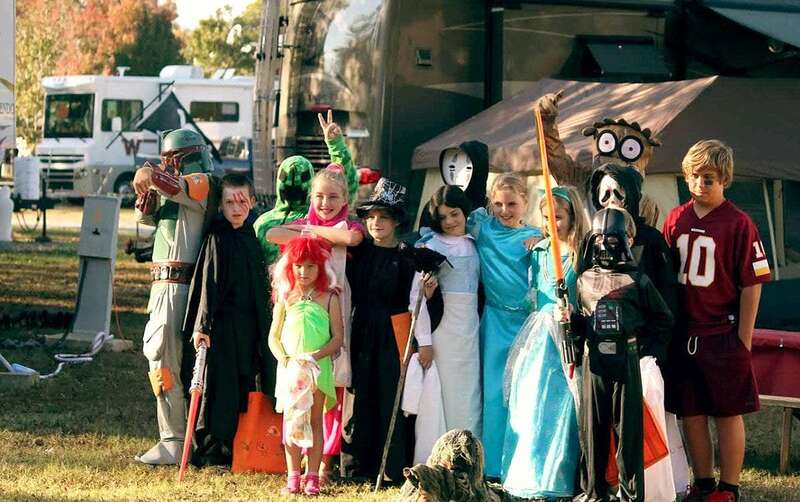 Some additional activities, like tomorrow’s costume contest, golf-cart parade, and trick-or-treating have been planned and provided by the campground, which is why the Burrells arranged to have the RVHS Fall Meetup in this location. RVHS stands for RV HomeSchool. It’s a club created by our friends Mike and Michelle Burrell, who have been on the road with their kids for almost three years. Mike and Michelle were enjoying family travel, but realized that they missed some of the community they’d had when they lived in a neighborhood. They founded RVHS with the intention of creating a homeschool club experience for limited periods on the road. There have been three RVHS meetups this year: in Florida during the winter, Maine during the summer, and here in Virginia during the fall. If you’re in the club, you’re invited to show up to as many meetups as fit your schedule and style. “Travel is a fundamentally destabilizing activity, which takes you out of your day-to-day routines,” said Mathias Vestergaard in a recent post to the blog Mindful Matter. He goes on to say that the instability travel creates is the very factor that gives it the potential to change your life. I agree on both points. You travel because you want to change in some way. You want to be challenged or you want to be opened up to something new, either in the world or in yourself, but the constant change of full-time travel requires that we actively seek out some constants, like people we enjoy. My family has done an excellent job of making friends while we travel. We’ve met other families through churches, Yahoo groups, campgrounds, and libraries, and some of these people will be lifelong friends. Yet I have discovered that meetups are great because the families we connect with there all have the nomadic life in common. We understand that bent in one another, our kids understand that we’ll have to part eventually, but we all have the means to keep meeting up at another spot down the road; it’s an ability that our stationary friends, no matter how they love us, don’t usually have. We’re here! I open the door of our Jeep and jump out while it’s still moving–a stupid idea because I’m holding my iPod and rather than having my hands ready to catch my fall, I end up flopping on the ground (but saving the iPod) and my friend Aiden laughs and helps me up to meet the crowd of kids from our RV homeschool group RVHS. During the meetup we do our school really fast in the morning so we can go do activities like thumb wrestling competitions or pickle ball (a game that is like large scale ping pong with whiffle balls), or, when it gets later, night games and movies. And after we’re all tired out from playing Infected (a game like tag), we go play Call of Duty 4 or Black Ops in one of our RVs. Soon we all have to go home and settle down for the night (unless it’s Friday or Saturday and we can have a sleepover). Sometimes we go on field trips to museums like the Mariner’s Museum in Newport News or the Yorktown Victory Center in Yorktown. Do you hear the excitement in that? This is from a boy who, in the last year alone, has attended the Indianapolis 500, snorkeled with manatees in the Crystal River, found shark’s teeth on an Outer Banks beach, had his first Disney World experience, been to the Huntsville Space and Rocket Center, run North Carolina rivers in canoes, kayaks, rafts, and float tubes…and got his picture taken with President Jimmy Carter. Yet the prospect of spending three weeks with his roadschool friends is enough to make him jump out of a moving vehicle. Our family didn’t attend the summer Meetup in Maine, so we haven’t seen most of these people since we were all together in Florida last winter. Some are new to the group; some are completely new to life on the road. That makes this fall feel like a real change of season, a chance to catch up beyond our daily round of liking one another’s Facebook posts or checking one another’s blogs. After this, our family will spend a month in South Carolina and then head down to Florida. We know people there now, people who live in actual homes, and we have plans to go down one coast and up the other, seeing them. We also plan to paddle in the Everglades and snorkel in the Keys, get a local’s tour of Miami, and hang out with the Quebecois on Pompano Beach. But for Christmas, we hope to be in Orlando, where some of the nomadic families will be. God willing, we’ll spend Christmas with friends who understand what life on the road is like, who know you can’t buy your kids a pile of presents when you basically live in a large car, and who value spending time together more than anything else. We’ve got a church scouted out for Christmas Eve and recipes tucked away for making a big home-cooked communal feast. We’ll watch our kids ride their bikes around the park, have a few games of Pickleball ourselves, and maybe go for a swim on Christmas day. By that time, maybe we’ll be ready for the next big change of season. Some of the more expensive aspects of living in a Volkswagen Bus, along with some ways to save money. Bianca Dumas is in the middle of a 50-state road trip with her husband and children. 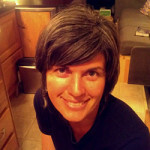 Her son, Gordon, and her daughter, Lillian, have written over 140 posts about their adventures on www.TurtleTells.com.